I think I might be confident enough now to add Laney to the ranks of the Untouchables -- the friends I feel thoroughly confident will always be in my life in one way or another. Barbara, a member of the original three (the others being Danielle, my oldest friend, having known her thirty years this month, and Gabriel, who I've now known for 22 years), has receded largely into the background of my life since she moved back to Virginia seven years ago. But the thing about her, is probably more than if I had such a long break seeing any other friend, if I saw her again it would be like we were never apart. We'd just pick up where we left off. When it comes to time spent together combined with the emotional intimacy that comes with truly close friendship, no other person outside those original three besides Laney really comes close. She's beginning to feel like family to me, in much the same way. When she was giving me a ride back home last night, she said something that's really stuck with me. We were talking about her plans for an annual camping trip with some friends this weekend, and she mentioned how she often feels social anxiety with other friends, but never does with me. Laney and I don't have awkward silences, really ever. We always have stuff to talk about, and it happens organically, really no matter how much time we spend together. Honestly I feel so comfortable with her, and have for so long, it never even occurred to me she was capable of social anxiety. I was like, what? I do have a unique history with her. I've technically known her for seventeen years, although I'd say we've been genuine friends for maybe fifteen years, and genuinely bonded friends for thirteen. She used to sit next to me during rehearsals of the Seattle Lesbian and Gay Chorus, which I joined in August 2000. Within a couple of years, we were both regulars in the group that would go out to eat at the Cheesecake Factory after rehearsal most Tuesdays. We didn't truly bond, though, until she came to my defense during "Boobgate" in 2004, which resulted in my resignation from both the SLGC Board and the chorus itself. That was maybe four months before I met Shobhit. But we've been hanging out regularly ever since. Laney turned 50 in 2007, and I have a photo set of the tiki-themed party her daughter Jessica and friends Thayer and Hayley hosted for her, at her own house in Columbia City. The party was on the eve of her birthday, but it went on until midnight, when everyone did a countdown to the date of her turning 50. I have always loved this shot I took of her reveling in that moment. Those of you with a grasp on basic math have likely figured out this means she'll be sixty this year -- and this time, I am the one hosting the party. Or I guess to be more accurate, she's hosting it and I am providing the venue. I offered to let her use the community kitchen in our condo building, which I reserved for the evening of her birthday September 30 -- which, fortuitously, happens to land on a Saturday this year. Laney has been living in apartments for several years now, no longer having the kind of space needed for a party. The house she had in 2007, affectionately referred to as "the cottage," was itself tiny, but she had a large yard that could accommodate larger groups of guests. I suppose technically she could cram the maybe 15 people expected at this year's party in her apartment, but they will much more comfortably fit in my building's community kitchen. While it's hardly bigger in square footage, it will have far more chairs, and also the option of going into the attached theatre, and features a functional kitchen far more user friendly for an event like this. She had been trying to decide what to do for her birthday this year, which I told her I felt she should definitely do something special for, and when I offered the kitchen she mulled it over and ultimately concluded it was the most desirable option. And once the night is over, she can go home to a place unaffected by a party, which I think will be nice for her, perhaps even a relief. So! Back to last night. 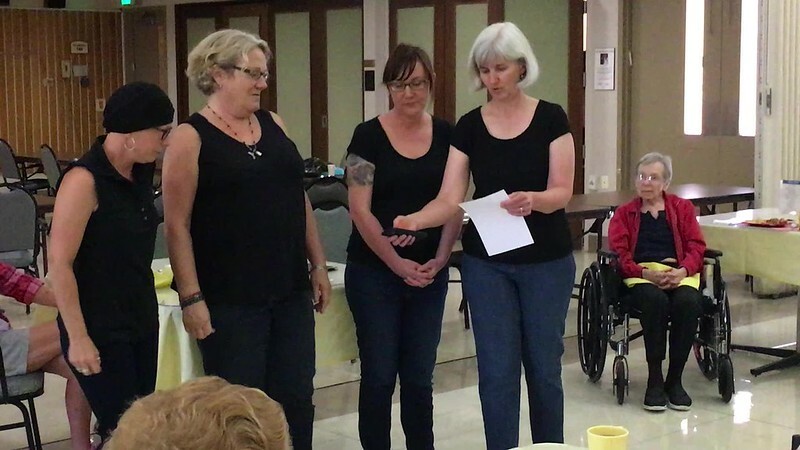 A bit of other background: while Laney was in the SLGC for several years, she has also been in the Seattle Women's Chorus for many years, I believe now even longer than she had been in SLGC. She's always either in the larger chorus or in the small ensemble, called Sensible Shoes (perfect name for a lesbian-majority group), but recently quit the Sensible Shoes because it was finally getting to be too much work and exhausting. 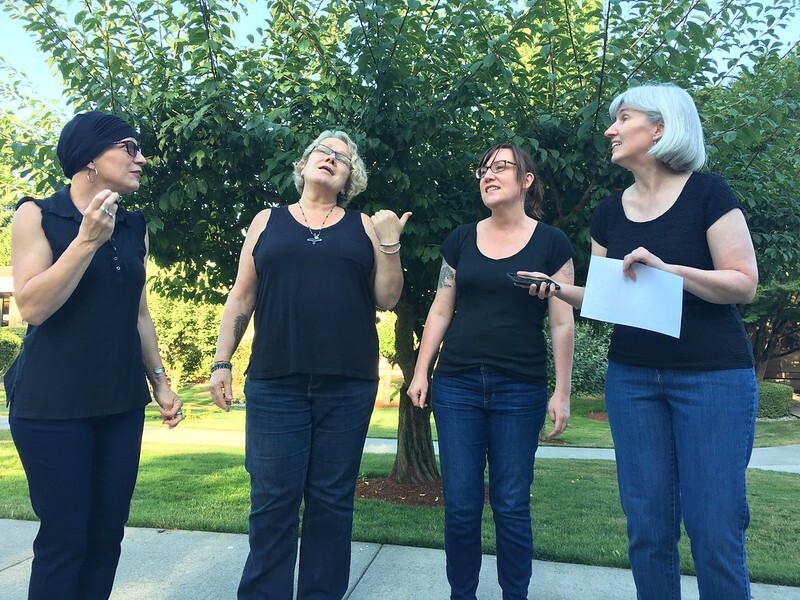 She still wanted an outlet for artistic expression and still wanted to spend some time singing in a small ensemble, though, so she took three friends from the Seattle Women's Chorus that she felt she worked most effectively with, and created an a capella quartet they're calling the B Naturals. They don't want to make this a commercial endeavor. 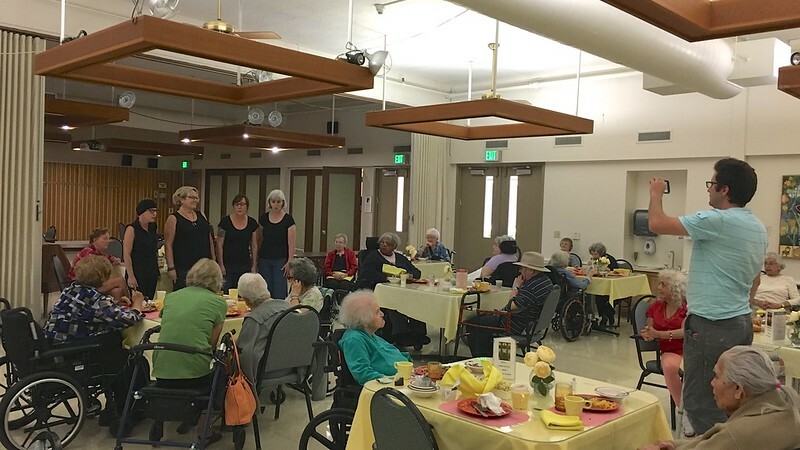 They just want to be able to sing for people, so they decided nursing homes were a good option: an audience likely to be openly appreciative regardless of how imperfect their performances might be. This kills two birds with one stone, giving them a chance to sing without the bureaucratic and financial barriers posed by being in larger, organized nonprofit groups -- not to mention allowing for their own complete artistic control as a small group -- but to provide a community service in the process. Last night was their first such performance, after several rehearsals. They decided it was time, Laney told me last night. And I was one of just a few friends asked if we wanted to come see them perform; three of us came -- a mutual friend of theirs they all call "Mary the Good" (a nickname apparently held over from a job she used to have); a guy named Alán (pronounced "a-lon") who used his phone to take video of the entirety of their performance; and myself. Since Alán took exclusively video, it's just as well that I took all photos, with one exception -- their performance of "Cake," a parody of George Michael's "Faith" with lyrics by Laney. You can click either the top or bottom photo in this entry to be taken directly to the full photo set from last night on Flickr, but clicking the middle image will play that video. When I was figuring out what photo collection to put the set in, I had nearly forgotten I already had one dedicated to small ensembles Laney has been in, now four of them: DISH (two photo sets, 2005 and 2006); 3 Second Rule (2 photo sets, 2006 and 2007); one small set of a performance with Sensible Shoes in 2013; and now the B Naturals. As it happens, my YouTube account has four videos of performances from the 3 Second Rule show in 2007, which also featured Hayley, and even Llyra, a woman both Laney and I used to sing with in the SLGC. She didn't make it to that reunion picnic last weekend. Anyway, guess what one of the songs was? George Michael's "Faith"! Watching the performance last night was an interesting experience. I didn't realize it was a home for Jewish Seniors until one of the B Naturals was asked to keep her bottled drink outside the dining room because it was somehow not kosher -- the employee called herself "the Kosher Nazi" without even seeming to recognize the irony of the phrase. Perhaps she did though. It took me a while to realize the space just outside the dining room, where the B Naturals left some of their things on a table, was actually a kind of synagogue room. I wish I'd taken a picture of it, and I'm kind of kicking myself now for not thinking to. I focused all my photos on the singers. Alán and I both went out into the middle of the dining room while they sang -- Alán more directly in front of them, for the purpose of his video taking. I stood next to a thin pillar in the room, making sure I was not blocking anyone's view, and thus all my photos are at more of an angle to the quartet. I'm sure both Alán and I kind of stuck out like sore thumbs standing there in the middle of these elderly Jewish people eating their kosher dinners, but whatever. They hardly paid attention to us, and for the most part paid attention to the singers. There were some moments when some person or another who was hard of hearing had to speak rather loudly to an employee while the singing was going on, and I wondered how distracting any of the other residents found it. I could find no one who appeared to be anything but into the performance. It happened even during my recording of "Cake," but as you can see from the video, it barely got picked up in the sound. Laney later declared that twenty minutes was perfect for a performance like this, which they scheduled at 6:30 so it would be within the final half hour of the home's scheduled dinner time. Although they clearly enjoyed it, they were clearly ready for it to be done once it was heading toward 7:00. When they finished, the women of the quartet mingled with the group. One guy, who had been delighted by their rendition of the Beatles's "When I'm Sixty-Four," told them he was from Liverpool, and although he's been in the U.S. for some thirty years, he had been good friends with a guy who used to book gigs for the Beatles. He was pretty eager to share that with them. Of all the small ensembles Laney has been a part of, I think I can declare the B Naturals the noblest of the bunch. I think it's a great idea, which will provide them with an outlet for unconstrained artistic expression while also providing a service for an underserved community -- elders -- that they would otherwise not be getting. It's a win-win.